Clicking the “Install Now” link above will install the Predator Tracker application on your computer and Adobe Air if not already installed. Please note that the application is about 295MB. Please see the Installation page for more details and information on how to install the application manually. Watch videos about how researchers study the movements, behavior, and feeding habits of large predators (such as bull sharks, alligators, and snook) in Shark River. 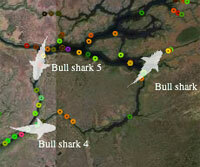 View predator movements on a map of Shark River and see how they vary over time, season, salinity and temperature. 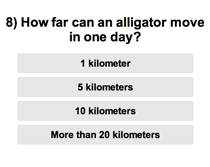 A quiz to test your knowledge after you’ve watched the videos and explored the data.